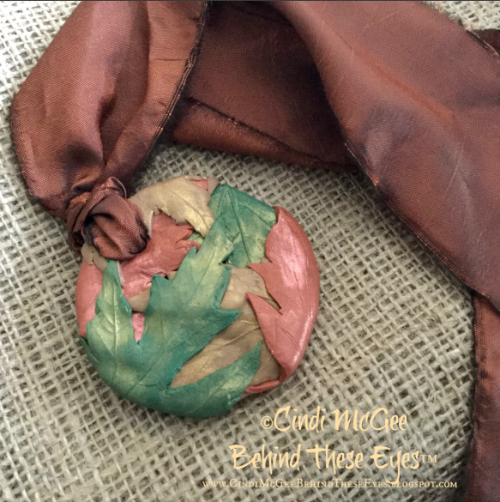 The leaves I molded were about 1 1/2” – 2 1/2” across at the widest part. Adjust the amount of putty you use to mold your leaves as needed. For this size, mix equal parts of Amazing Mold Putty to create a ball about 1 1/2-2” in diameter. Flatten ball to about 1/4”. 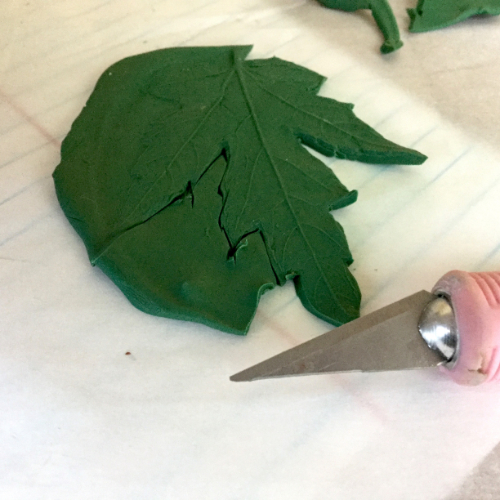 Place real leaf into putty and press gently with fingers to transfer texture and shape. 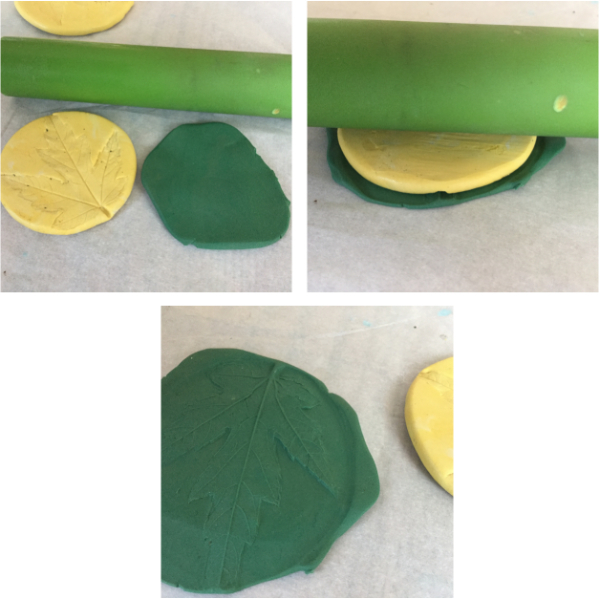 Let the leave remain in the mold putty until it has cured (follow manufacturer’s instructions – takes about 20 minutes) and then remove the leaf. 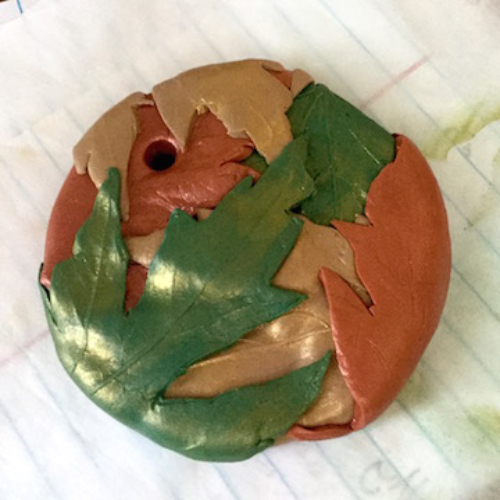 I created 1 mold with the leaf facing upwards and 1 facing downwards. Both worked well, but the veining was more prominent with the leaf facing upwards. Condition Cowboy (dark brown) polymer clay and roll on a non-stick surface to about 1/4” thick. Cut circle with 60mm round clay cutter. Condition Cinnamon, Latte and Jungle polymer clay. Roll to about 1/8” thick. 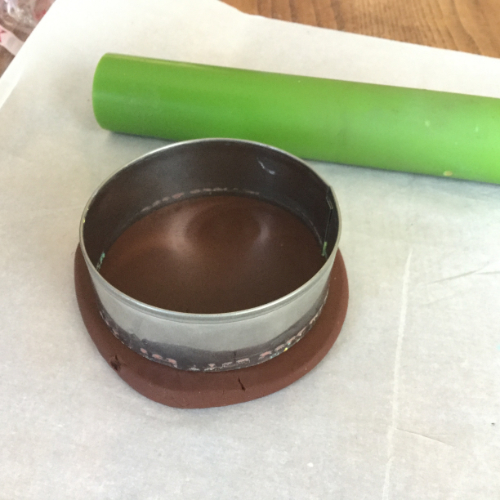 Place the mold over the rolled clay, and use the clay roller and your fingers to gently press the mold into the clay (you can obviously do this by placing the clay on top, but I found the results better with this mold to do it this way). Lift mold to remove mold from clay leaf. Repeat with each color. The number of leaves you make will depend upon the size of the original leaves you use for the mold. Use craft knife to trim around the leaves. 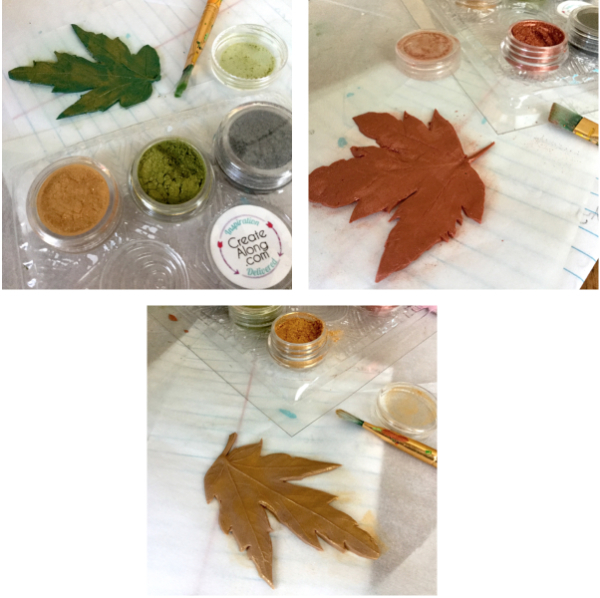 Use paintbrush to very lightly dust each leaf with a coordinating shade of metallic pigment powder. 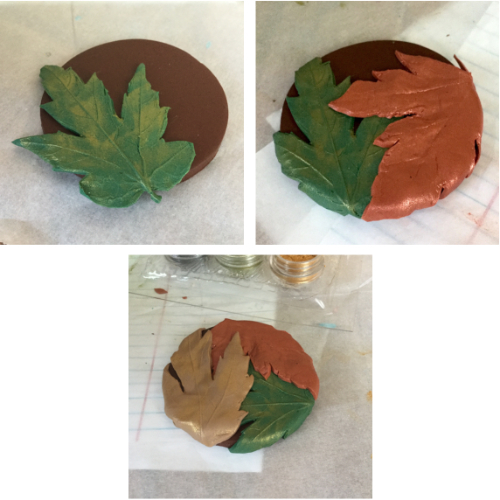 Begin placing leaves over the brown clay disc, wrapping around the disc slightly. Overlap the leaves slightly so that the layers of colors show through. Cover the front and back of the pendant. Make a hole in the top of the pendant. Bake according to manufacturer instructions. Let cool. I chose a wide metallic satin ribbon for my pendant, but choose the material you would like to use to hang your pendant and add a closure.